What, it's the last day of June, already? This month has certainly gotten away from me. Why, I'm only on Day 12 of 30 Days of Fabric Stacks. Good thing we have until August 6th to complete all 30 prompts! If you're also early in the process or just getting started, don't fret. We still have plenty of time. And plus, it's more important to enjoy the journey and to allow yourself to ponder each stack, than to push for the end. Of the stacks I've made in this last grouping, this is my favorite. It sprung up around the "yellow" prompt. 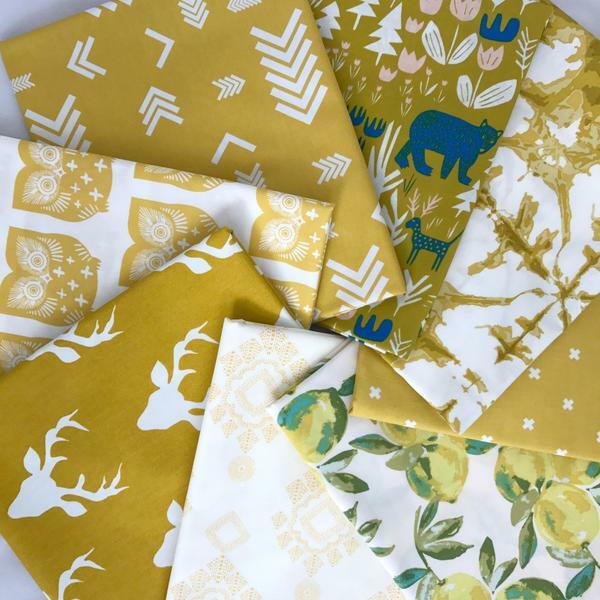 Rather than collecting my yellow fabrics, I wanted to create a color scheme that feels like what yellow means to me: cheerful, refreshing, playful. I ended up with a stack that reminds me of strawberry lemonade in the shade. Marci Girl also happens to have been our winner for last Friday's challenge prize! I also like lots of the Complementary Colors stacks. I think they push many of us outside of our comfort zone because the colors are so bold when paired complementarily. The above composition by Mrs. Dragon is highly quilt-worthy in my opinion. And, yes, I am a sucker for the tiger kitties! Today I get to award another participation prize! A random draw of all those photos submitted with the event's hashtag....awards a $30 gift certificate for Bobbie Lou's Fabric Factory to CurlyCQuilter for her Pink Stack! Congratulations! I'll be in touch to deliver your prize. Good luck and much fun to all!